You can’t go wrong if you follow the rules, right? But what happens when you come across something where the ‘rules’ don’t make sense – and yet you still try to hold on to the certainty of ‘the rules’? Or, to put it another way, just how much damage can one ‘rule-follower’ do to your business? – even if they don’t work for your business? I’ve been riding into town most days, if only for the exercise, and to give me a brief break from all the writing and the rest of the work I do. It only takes perhaps 15-20 seconds to flip between the two setups on the bike, so it’s a very practical shopping option: I ride to the store, flip the bike into the shopping-trolley, do my shopping in that store, roll or ride to the next store or bank or cafe or whatever, and so on until everything I need to do in town is done. 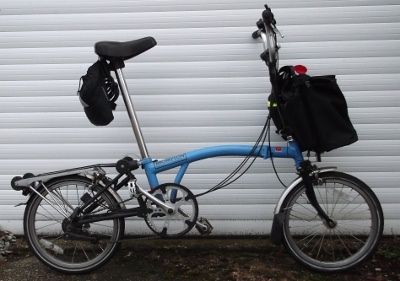 I’ll admit it’s an expensive bike – as you’ll see all too soon on the Brompton website. But because it’s so practical, it’s already paid for itself several times over just in the parking-fees and more that I would have had to pay if I’d taken the car into town. The bike “pays its rent”, as my now-elderly mother would put it. Yet because it’s an expensive bike, and so central to how I relate with the town, I don’t feel safe enough to lock it up and leave it anywhere out of sight. 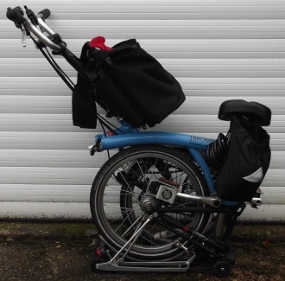 I do have a bike-lock, of course, but in five years I’ve never yet had to use it: instead, I fold and unfold the bike as needed, to take it everywhere I go. 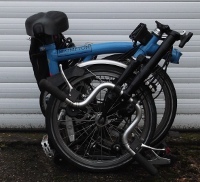 Around a week ago, I rode into town as usual, stopped outside one of the two supermarkets in town, flipped the bike into the shopping-trolley configuration, and rolled it into the store. Exactly as I’ve done most days for the past five years. It’s a new security-guard – much younger than the one who’d been here for the previous year or so, and knew me well. I try to remonstrate with him, point out that I’ve brought the exact same bike into this store for years, point out that it’s no larger and functionally no different from the shopping-trolleys that he does allow in the store – other than that it’s cleaner, because its rolling-wheels aren’t dragged through the muck of the street outside. None of this makes any difference. All that he can see is that it looks like a bike, is used outside the store like a bike, the rules say that bikes aren’t allowed in the store, and he doesn’t have a rule that covers bikes that aren’t bikes. I move as quickly as I can through the store, lugging the bike in one hand, and balancing my shopping-items precariously in the other. Then I finish my shopping – with far fewer items then I’d intended to buy when I’d first gone into the store. Then I leave – and I don’t go back. Which is a real nuisance, because there are several things that I can only get in that store. It’s not a kind of childish “I’ll punish them for doing this to me”. For example, I’ve been once by car to their much larger out-of-town store, to get a stock of those needed-items – though I don’t like doing that, not least because using a car for that kind of purpose is so darn wasteful. What it’s really about is that I just don’t feel safe any more: even if I do comply with that rule-follower’s demands, the feeling is that those demands will change at random, for the simple reason that the rules don’t make sense. In short, whatever I do or don’t do, it’s ‘wrong’. And I’m not good at coping with that kind of pointless ‘game’. Yet it’s not just that store now. I’ve shopped elsewhere in town a couple of times since then, but I can’t shake the feeling that at any moment some other random rule-follower is going to tell me that I can’t be there, that I’m ‘not allowed’ to do what I need to do, even though the way that I choose to do it causes no difficulty to anyone else, and causes less overall harm than any other way. The store’s online customer-service now tells me that there isn’t an explicit policy on this, but that I can talk to the store-manager, and he’s allowed to decide whether or not I’ll be allowed to bring the bike into the store. But I’m not sure that I’m even comfortable doing that: dealing with one person’s wrong-headed whim was hard enough, what happens when I have to renegotiate all over again with the next manager, and the next, and the next, each of whom may have yet another random opinion? Yeah, I know it all sounds a bit petty, perhaps even a bit crazy. Yet I also know that feelings are real facts in this kind of context: and when scrambled ‘rules’ and random opinions ride roughshod over those feelings, pretty much everything grinds to a halt. Which is exactly what’s happened here. The real point here is that the trust is lost. In an all too literal sense, it’s broken. And once broken, it’s very hard to mend. So let’s look at this in terms of business-model, business-architecture, enterprise-architecture, and the like. The store’s business-model depends on people like me spending in the store. The town‘s business-model depends on us spending money in the stores and suchlike. I’m not a big spender anywhere, but adding it up, I’ve spent perhaps £1-2000 each year in that store, perhaps five times that much each year in the town itself. Over five years that’s perhaps £10,000, and £50,000 or so in the town overall. In other words, not a huge amount of money, but not insignificant, either. Yet the store’s business-model – and the town’s business-model – also depends on me being willing to buy there, to buy in town. Without that desire to buy, I don’t buy. Without that desire to buy, no-one buys. And in this insane economics, if no-one buys, the store and the town are dead. In other words, not trivial. In short, the business-model depends on an architecture of trust. For which the hardest challenge is to manage the balance between certainty and uncertainty, on all sides of the equation. Rules give a comforting sense of certainty – especially to those who make up the rules. Yet as we’ve seen with SCAN, rules will only go so far: they only make sense when the world conforms to our expectations of ‘order’ – which it often doesn’t. The more simplistic notions of complexity – viewing uncertainty only through the lens of statistics and probabilities – can also be risky: especially when people are foolish to think that ‘low-probability’ is the same as ‘no probability’… Kurtosis-risk, or long-tail risk, is always a significant challenge – especially in the days of social-media, where small-seeming complaints can suddenly go viral, causing damage far beyond the nominal direct cost. The reality is that that architecture of trust must include awareness of the potential impacts of the ‘one-off’ and the seeming-unique – the so-called ‘chaotic’ domain for sensemaking. Rules do not and cannot make sense in the chaotic-domain: which is why principles and values and suchlike are so important, throughout every aspect of a business-architecture and beyond. The moral of this story? Remember always that feelings are facts: facts that we must acknowledge and include within each of our architectures. And remember, too, that whilst making rules is easy, it’s the little things – the small, subtle, ‘gotchas’ – that cause the real upsets: so always remember to design for those ‘unknown unknowns’, because they’ll always be there somewhere – and almost always where we least expect them. Over to you for your comments, perhaps? I believe that “not ever knowing what the rules are” is symptomatic of a dictatorship. It’s how they sustain the requisite level of fear. Might be worth telling that to the CEO, never mind the customer service rep. I suppose the town administration should be eager to promote biking, according to my limited experience of UK there are too many cars everywhere. Also Brompton should oppose such rules. Some people have coats that are worth more than your bike. When they go to the theatre, they don’t stuff them under the seat (like I do with my cheap coat) but deposit them in the cloakroom, in return for a ticket and a tip. How much would you be willing to pay for a safe bike-storage service? How many customers would be needed to make such a service viable? And would the council or the retailer be willing to subsidize it? The hardest part of getting people to give up on over-reliance on “rules” is the loss of freedom: freedom from thought, freedom from responsibility, etc. Having to think for yourself makes you a slave to justification. Should be compulsory reading for anyone working on governance processes. This one gets a linked tile and a recommendation on my eapatterns blog. Call the manager, require written permission and plastic wrap the result for future guards. Do it and all parties benefit.